The timeless design of the 1911, the ageless significance of interstellar materials, the innovative techniques of an all-American gun company – a trinity of circumstance, fused together into the perfect embodiment of a transcendent vision. We present Cabot's magnum opus: The Big Bang Pistol Set. After billions of years of travel, a meteorite hurtled to earth in Gibeon, Namibia during earth’s pre-historic times. Unknown to western civilization until the early 1800’s, pieces were used by the ancient Nama people in the construction of tools and weapons. In 2015, its destiny not yet fulfilled, the hands of Cabot Guns’ master craftsman wrapped around a 77-pound piece of unshapen material and so began a transformation. We too, like the men of yore, saw in it the potential to shape earthly perfection from materials of the cosmos. Destined to be different, Cabot’s innovative design and manufacturing team tackled a project that is without peer in feats of modern human engineering. From a space-rock, we crafted a complex and precise mechanism. We unlocked the ancient secrets of a lifeless hunk of iron-nickel alloy, formed it and gave it breath with which to speak, showcasing an other-worldly creation to the world. Billions of years through time and space are perfected now into an ultimate achievement of American design, willpower, and can-do spirit. 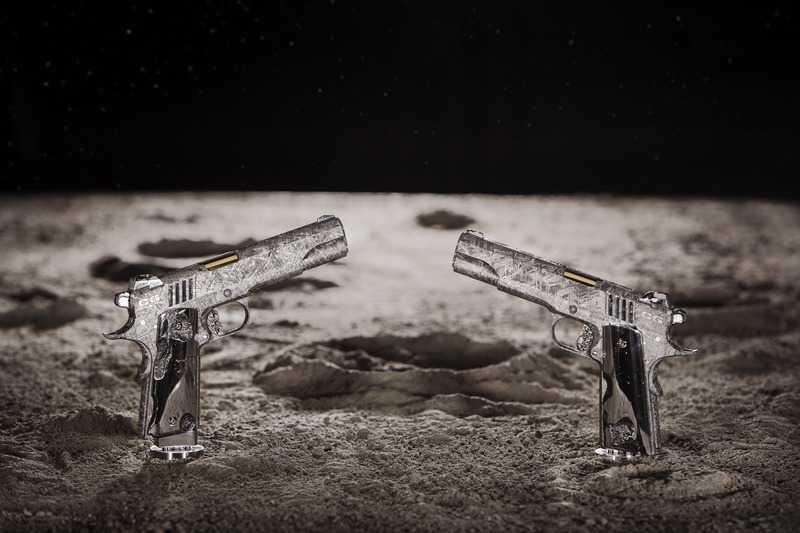 Set on accomplishing the impossible, Cabot Guns set out to do something truly different in the creation of the Big Bang Pistol Set. Small parts and accessories have long been made from exotic and uncommon materials, but never before has an entire modern weapon been crafted from such a coveted medium. Even that we couldn’t settle for; so we built two, a matched left and right – serial numbers individualized to reflect the geographic earthly coordinates where the Gibeon meteor came to rest on our planet. The pistols are fully-functional – and resultant of their National Match barrels, accurate; verified both on the rest and in off-hand shooting. Leaving nothing to chance in terms of functionality, our engineers used electron beam technology to meticulously add bimetal support only to the frame/slide rails, hammer, guide rod and extractor of the Big Bang set. – and the pistol’s components, down to the barrel bushing and trigger – are 100% Gibeon meteorite. In crafting the Big Bang Pistol Set, we wished to maintain as much out-of-this-world detail in our finished product as was possible. 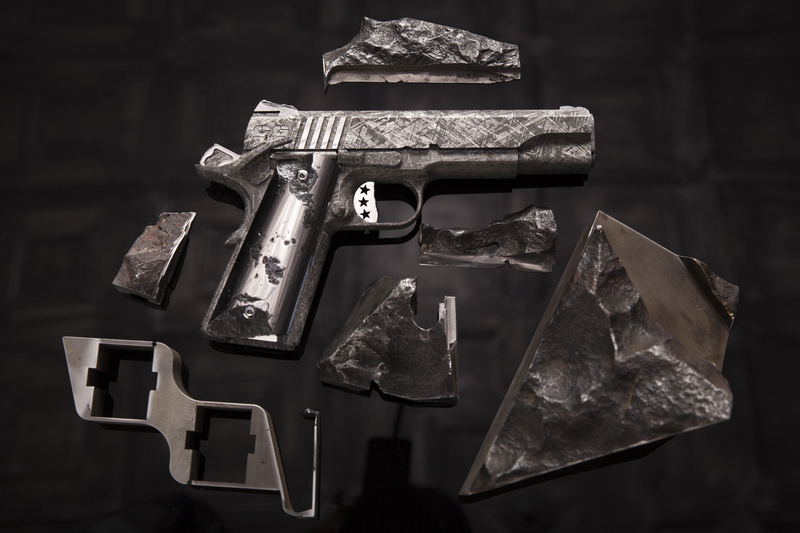 On close inspection, “voids” in the material itself are able to be discerned, oxidation of high-iron content areas gives a hint of the meteor’s age, and exposed “bark” from its outermost shell adorns numerous surface features of the pistols. Each are exact copies of the other, but both are entirely unique. Different finishing techniques highlight the diversity of the material from which we extracted these weapons. High polish flats on the grips, natural patterning on the slide and frame (acid etched to accentuate the supernatural texture of the meteors internal structure), and elsewhere intact outer-edges of the meteorite that survived the heat and violence of atmospheric entry – all come together to bring skyward-turned eyes back to earth, to gaze in breathless amazement. Never before has such precision been applied to the making of a meteorite weapon. Kings, Pharaohs, and conquerors have historically carried for both ceremonial and practical purposes, weapons of unmatched construction and aesthetic appeal. So to now may a modern sovereign carry at their sides and in their hands a weapon with no earthly equal. 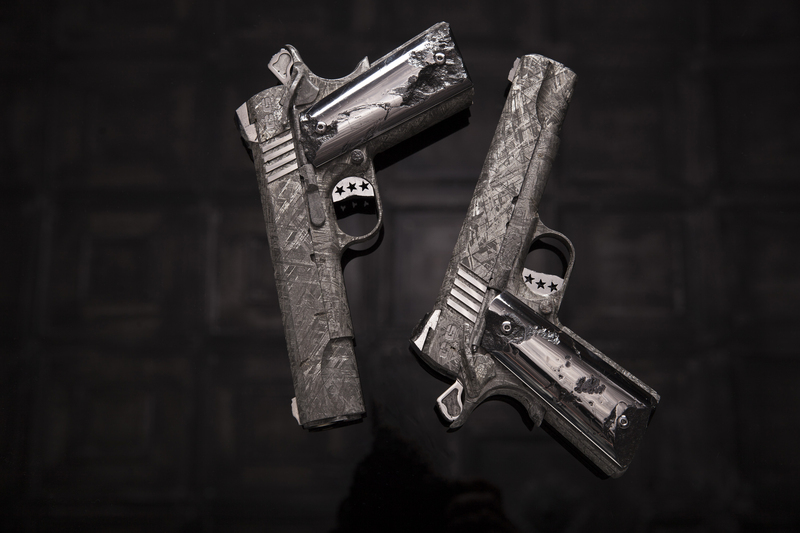 The Cabot Guns’ Big Bang Pistol Set, available now – and never to be made again.